Mumbai Se Boutique is one of my favorite clothing stores in Dubai. It's name means "From Mumbai" in Hindi and it carries "high-end indian fusion" clothing and accessories, including jewelry and purses. Mumbai Se grabs your attention from afar with it's shopping windows displaying beautifully made tunics and dresses in gorgeous color combinations. It's not traditional clothing, but definitely borrows heavily from traditional design, cut and embellishments. For instance, there are dresses that are decidedly cut in western fashion, but adorned with fabulous traditional patterns. Or a traditionally cut tunic, however it's fabric colors of pink and green can make Lily Pulitzer proud. 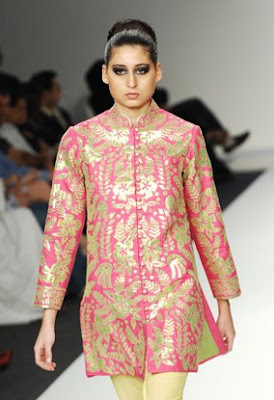 All the pieces are from indian fashion designers and quite expensive, but, oh so worth it!